Arizona state Senate candidate Eric Descheenie ran a recent 13.1-mile race in two hours before he was off to Window Rock to catch up with Navajo Nation Council delegates and committee meetings. 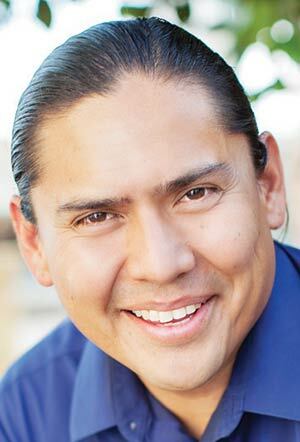 This back and forth between suits and running shorts has defined Descheenie's campaign over the last month since he announced his candidacy for the Senate seat representing District 7, where the Navajo Nation is located, in the Arizona Legislature. Currently Carlyle Begay holds the Senate seat after he was appointed last year to fill the vacancy left by Jack Jackson Jr., who had resigned. Begay is running to retain his position, but Descheenie and current District 7 Rep. Jamesita Peshlakai are vying for the same spot. Descheenie has gained the endorsements of his boss, Council Delegate Jonathan Nez (Tsah Bii Kin/Navajo Mountain/Shonto/Oljato) and state Rep. Albert Hale. Descheenie has become a regular recreational runner over the last year and ran the entire Shiprock Marathon for the first time last month. But participating in local foot races is part of his larger process of staying grounded. "It's just a great opportunity to be amongst our own people, amongst our own communities," he said. "When you get into these committee meetings and sessions things are more formal and a lot of times you don't catch what the people are really experiencing." Descheenie has worked as a tribal liaison for the Arizona Department of Housing before returning to the reservation in 2008 to work with then Speaker Lawrence Morgan. He continued in the speaker's office well into Naize's first term, but resigned in 2012 to work for Navajo County. Today he is Nez's legislative advisor and attends both chapter house and Council meetings on a regular basis. He earned a bachelor's degree in sociology in 2003 from Arizona State University. Again and again Descheenie highlighted this concept called "human community." He said, "We share this whole area, with St. Johns, with Holbrook, with Show Low (and) we have little to no human community. The reason I say that is race is still an issue." Descheenie cited the racial tensions that have come from Gallup's "Change in your heart, not in your pocket campaign" and recent work he did in the city of Flagstaff as evidence of strained race relations between Navajo and non-Navajo communities. He said that in the case of Flagstaff, the city wanted the Navajo Nation to pick up the bill for rehabilitation services to Navajos suffering from alcoholism. He said the city was just trying to put the burden on the tribe rather than addressing the needs of the Navajo people who live there. Descheenie said he wants the Navajo and non-Navajo people in District 7 to work more cooperatively on issues, such as education. As a father of two young kids in the Chinle area he has seen firsthand the needs of children in the reservation. "This is a human issue, it's not a Flagstaff issue, Navajo issue, Hopi issue. Government tends to forget that you are governing people not things," he said. His main concern is infrastructure development. He said the Legislature need to invest in telecommunications, water, roads, etc., in this part of the state. Descheenie also said that he understands the difficulties people in the reservation experience on a day-to-day basis with opportunities and infrastructure because he has lived it. "It's not easy to live in this district," he said. "It's not easy to live in Navajo in particular. To have a residence here and to go through all the things our people go through, it means something to say you live here. "What it boils down to is I feel that I have a greater purpose, it goes to everything I mentioned," he said. "People here have real concerns, they feel it and live it and someone needs to advocate for them."